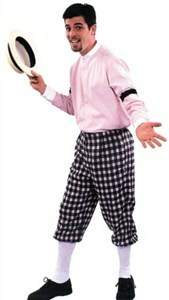 I'm a little disappointed that there aren't more choices for the "old school" knickers like Payne Stewart used to wear. My man Payne always looked stylish in his knickers that became his trademark attire on the PGA Tour up until the time his plane crashed in 1999. I found this pair of costume knickers on Amazon, but they are more geared for Halloween than they are for playing 18 holes. I wouldn't wear these to paint my house. They looked like a cheap imitation and more like clown pants to me. I was able to find some really nice updated stylish knickers for wearing out on the links, but I had to borrow from the world of cycling and climbing. The former being these cool Civia Wool Knickers, which to me look the most like the old-fashioned style than any of the others. I really like the wool material for its comfort, breathability, and range of motion. The latter being the Prana Nemesis Knicker. These knickers look the most hip to me for you modern GQ men while still providing a great deal of performance for golfers because of the extra material in the crotch and knees.